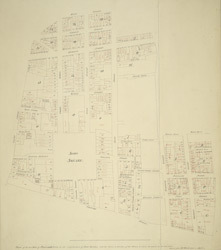 The title and scale bar of this copy of White's plan appears at the foot of the sheet. On the Duke's death, the estate was divided into individual properties and sold. The names of the new landlords are indicated on the plan in red ink.